Home » Resource Articles » Film Preservation or Restoration – Any Difference? Film Preservation or Restoration – Any Difference? Preserving and Restoring at risk films is a big deal. Yes, there is a significant difference between these two concepts in terms of corrective processes and methods. In a nutshell, film preservation has to do with the recovery of the physical film body itself, if possible. Film frames that are very much degraded or heavily damaged are in the realm of those dedicated in attempting to get back those pieces of cinematic history as complete as possible. Wide temperature variations, uncontrolled humidity and abuse are the main culprits to physical film damage. For the most part many films made between the turn of the 20th century and surprisingly those well into the 1980’s are at high risk of being very compromised or lost forever. The relentless effects of time, poor storage policies and environments (hot, humid, water damage, etc), lack of budgets for preservation activities and general industry neglect are all very large contributors to the complete loss of many old films. Add to that the results of abuse, particularly when badly adjusted and maintained projection equipment is used coupled with incorrect splicing technique and inferior cinematic repair and storage materials. Alternatively, film restoration has more to do with the digital world, using digital signal processing techniques or DSP for short. Once films have been physically recovered to the point that they can be either digitally telecined by scanning or by projection, sophisticated image processing techniques can then be applied to further help recover and rejuvenate those at risk films. Techniques like Dustbusting that removes dust, dirt and to some degree scratches from digitized film frames or by applying more aggressive and exotic digital ‘scrubbing’ algorithms that involve deeper image processing will take the film recovery process to the next level. The images above is an example of a dustbusting cycle on a pretty rough 8mm film (believe me there is much worse). Lots of dust, dirt with scratches. I got a single frame from a film that is typical of the quality of the film strip itself. I just used a single auto cycle of dust and dirt filtering and a light setting for scratch removal. You can see for yourself the bad stuff is removed without affecting the underlying image. The film could use another scrub but you get the idea of what is possible. 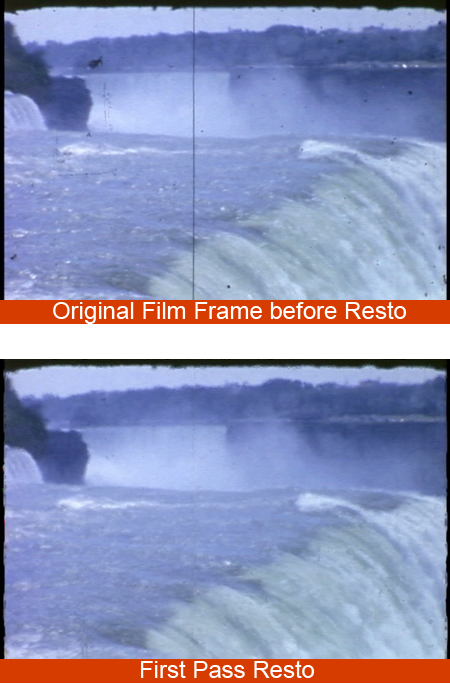 Many digital image processing techniques used in film restoration take advantage in large part the image redundancy between film frames to recover missing information. Dirt impacts, lost image fragments for example are mainly single frame occurrences. By analyzing within the film frames (spatial techniques) and/or by using before and after frames of the frame to repair (temporal techniques) many dust and dirt affected frames can be ‘cleaned’. A film frame being recovered for example that has a big lump of dirt covering an image area, may have that same size image section uncorrupted and intact on the next frame or two. The ‘good’ image section is isolated and cut out, then overlaid in the ‘bad frame’ and stitched so the edges can be smoothed out with little or no pixel distortions. By taking advantage of slow inter frame content changes inherent in film sequences, most image fragments from other intact frames can be used for recovery without too much concern for fast movement from frame to frame. In cases where there is fast movement frame to frame and the current filter setting is inadequate, would require other software functions within the resto toolkit to deal with these situations. In turn, will affect changes in technician workflow to address the one of many corrective aspects of film restoration. I have several articles planned that will outline the filtering methods used by the many types of image processing algorithms, so check my blog often for new articles or just contact me for more information. Hi! Do you know if they make any plugis to safeguard against hackers? Prevention and restoration different on the procedures but with the same purpose. I’ll bookmark your blog and check again here frequently. I am rather certain I will learn many new stuff right here! Good luck for the next! It looks that the process of this will take a considerable time. Is there an approximate charge per hour of this restoration? Film restoration work is indeed a time consuming process. There are many types of film damage and all projects present its own unique problems to ‘repair’. A well planned workflow is a must in order to get a successful outcome without repeated rework. The workflow is tied to the restore tool purchased. Some facilities charge by the hour, some by the foot. I’m not sure what the thinking is in the choice, but either way it will cost. I’ve seen hourly rates in the $225/hr range to better than $1/ft, where the charge by the foot would apply to the smaller film gauges. The cost covers the many steps within the workflow that is to be implemented. From clip frame separation (2:3 pulldown), scene breakdown to several auto/manual filter operation. Lots of manual intervention and investment in high cost computer platforms for the intense number crunching. Costs quoted to customers is a mix or your risk assessment costs, overhead and profit margin. The service provider must decide.